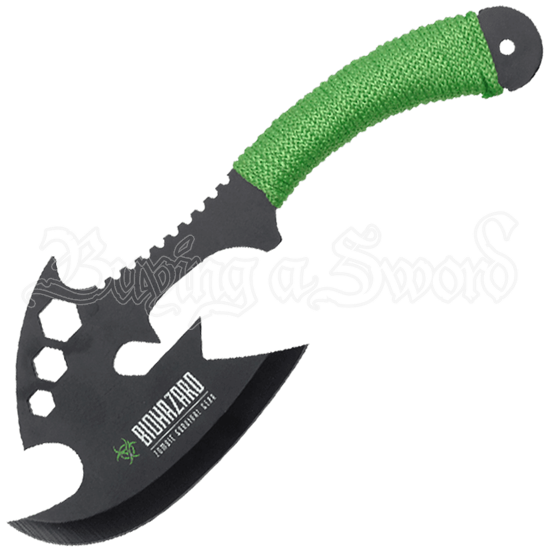 The stylized cutouts and serrations of the Green Paracord Biohazard Hatchet befit a post-apocalyptic setting. It offers versatility and strength to those still numbered among the living, a useful tool for combat and daily survival. Cutouts lighten the weight and create balance, while serrations, sharp points, and a wide cutting edge enhance its function. A full tang contributes to its durability and power. The neon green paracord wrap assists in maintaining a firm grip. This tactical axe comes with a black nylon sheath for easy storage.